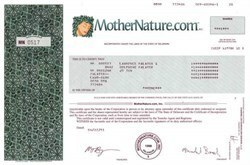 Beautifully engraved certificate from the MotherNature.com. This historic document was printed by the Security Columbian United States Banknote Corporation and has an ornate border around it with a vignette of the company logo. This item has the printed signatures of the Company’s President ( Michael Barach ) and Treasurer. On November 7, 2000, Health site MotherNature.com announced that it was shutting down. It was a CMGI-backed company. The company was formed in June 1998 and went public in December 1999. Its stock reached an all-time high of $14.56 but quickly began a slide that took Mother Nature into a storm from which it couldn't recover. The site sold vitamins, supplements, minerals, and other natural and health-oriented products, and provided online health information. Unfortunately, the company couldn't take vitamins to help its own financial health. The assets of Mother Nature were subsequently acquired by Naturalist.com, Inc.